Heard the ovenbird today; I don't think I've ever seen one. 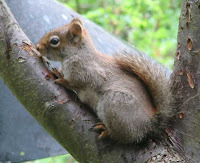 We've been hearing him daily, and well into the evening. 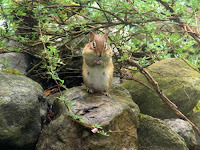 There are at least 5 chipmunks around and about, living in the stone wall or in tunnels out back under the hemlock roots. By the way, we also saw an Indigo Bunting today. 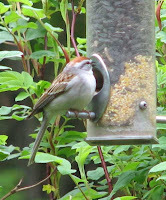 This was a male, on our mixed seed feeder. My sister tells me that this bird requires early successional habitat; we have that more or less because the power company has been clearing extensively under the power lines in the past few years.